One of the early items on the Bilderberg agenda was Star Visitor contact. Shortly after establishing itself, the Bilderberg Group collaborated with the Council on Foreign Relations (CFR), another international policy body devoted to world management. They discussed the problem of adjusting humankind to Star Visitor presence. Bilderberg and CFR decided jointly in the mid-1950s to enter into an arrangement with the Star Visitors: The Visitors were given an island in French Polynesia as a base on Earth. This arrangement afforded them an opportunity to monitor closely Earth cultures and behavior; and it permitted Earth governments a way to monitor Star Visitor culture and behavior. "It became an on-going experiment," as my former-NSA informant put it. He added that when official public announcement of the Star Visitor presence occurs, "they will be the ones introduced to Earthlings; 'Oh, by the way, we want to welcome our neighbors from the Pleiades, who by the way have been here since [the beginning of Earth] time, but [are] actually living in our place, date, space and time." NSC's Dr. Michael Wolf has previously revealed in his book The Catchers of Heaven that he worked with Visitors as part of his governmental duties. "I met with Star Visitor individuals every day in my work, and shared living quarters with them," while doing research at extremely- classified underground government research laboratories. He added, "Zetas work in underground facilities, as requested by the U.S. Government. The Visitors are not breaking the U.S. Government- Zeta treaties, but the Government has broken treaties by mistreating Visitors, and trying to fire on UFOs." Dr. Wolf also described working with very human-appearing races dubbed the Nordics and Semitics. He said, "The Semitics and Nordics [Star Visitors] come from Altair 4 and 5 and from the Pleiades [star systems]." Wolf also disclosed that in 1954 the U.S. had four Star Visitor corpses in the "Blue Room", Hanger 18 at Wright-Patterson Air Force Base, Dayton, Ohio. These bodies came from a series of retrievals of downed UFOs. "The first UFO came down in 1941 into the ocean west of San Diego, and was retrieved by the Navy." Between that and the first publicly-announced Roswell UFO crash in 1947, Wolf says there was another crash in 1946, as well as two other crashes in 1947. The following additional revelation will permit you to ignore those Boeing commercials and NASA press releases about how America currently is building its own first manned space station. My ex-NSA informant revealed that there has been a manned "deep space platform" in orbit above Earth for over thirty! years. "It [has] had three-man [American] crews as well as Russians 'on' since '68!" He further states that since 1973, the space station received additional extremely-high technology, "and has had upgrades since." His disclosure confirms reports I had heard previously from former military officers about a secret space platform in orbit. This disclosure makes clear that the Cape Canaveral Space Shuttles launches, and the "first" American space station being assembled by NASA', are just government "cover" programs. Such programs have served to deflect the public from becoming aware before now of the existence of a black-project military space station, and of classified military craft which can go well past orbit into deep space. Jesse furnished me additional details about its operation. The space station has been serviced by secret military spacecraft long before the first American Space Shuttle flew in 1981. In 1988 previous models of spacefaring military vehicles were superseded by the "Nautilus", a spacecraft with a rounded delta shape built jointly by special projects divisions of Europe's Airbus Industrie and U.S.'s Boeing Corporation. Nautilus has a propulsion system which utilizes magnetic pulsing. Nautilus-type craft make twice-weekly trips up into space and back, to service the secret international space station. The Nautilus is based in Utah. My informant would not identify the base, but said that it was positioned within a mountain so stealthfully that you could drive by and never know it was there. 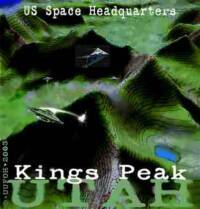 He also stated that the principal headquarters of the U.S. Space Command has been relocated from Cheyenne Mountain, Colorado to this underground installation in the Wasatch Mountains in Utah. Look for further significant disclosures in the months ahead, as the current U.S. Administration tries to disentangle itself from 50 years of Cold War secrecy. And as it does so, those who have felt all alone with their personal experience of contact by Visitors from the stars, (who have been deeply involved in our society and its evolution), should feel less isolated. 1. Jesse provided additional comment on successor craft to the secret military Space Shuttle. "Matter of fact, it (military Shuttle) was replaced in '85 with Aurora up to '92", thus indicating that the oft-rumored Aurora hyperfast aerospace vehicle not only was operational since 1985, but is already obsolete. Jesse says that its successor "followed on with DarkStar's retro-fit." This, according to the late USAF Colonel Steve Wilson, is the Lockheed X-22A DarkStar, a two-man discoid craft, which uses antigravity technology on a airframe perfected on Lockheed's "cover" program, a conventional unmanned reconnaissance drone, the X-22, also called DarkStar. Jesse tantalizes with a hint about the antigravity DarkStar's having becoming obsolete by "another [craft] in 2001", yet another exotic space vehicle. Jesse added, "The [Cape Canaveral] Shuttle stuff you see is for Hollywood to direct." Nautilus-class craft were also used at the beginning of the Gulf War, to penetrate Iraqi airspace from space. Soon thereafter, Stealth aircraft took over covert penetration operations.